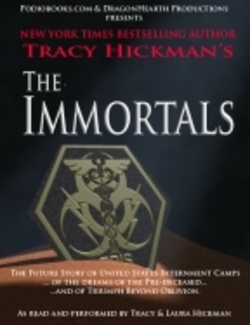 Podiobooks.com in association with Dragonhearth Productions, presents New York Times Best Selling Author Tracy Hickman's cautionary tale… The Immortals. The future story of United States Internment Camps … of the dreams of the pre-deceased … and of triumph beyond oblivion. It's 2020, and an attempted cure for AIDS has mutated into a deadlier disease, V-CIDS. The U.S., under martial law, has set up "quarantine centers" in the Southwest. Searching for his gay son, Jon, media mogul Michael Barris smuggles himself into one of centers only to discover that it and the other centers are actually extermination camps. With a strange assortment of allies, including the leader of the camp's gay barracks, an army officer and a local cowboy, Barris precipitates an inmates' rebellion that promises the unraveling of the death-camp system and the overthrow of the government that established it. As read and performed by Tracy and Laura Hickman. Published as a podiobook during the ten-year anniversary of its first printing. "Excellent and exciting … An important book…" Robin Wayne Bailey. We will send The Immortals to your Kindle at . The Immortals has been sent successfully to your Kindle!